The solution is simple to hide Run-Command Window when running commands or favorite commands! (Image-1) Hide Run-Command when running commands! As you can see above in Windows 10 shot screenshot, it is quite easy if you want to hide the alternate execute dialog after command start. or continue to want to leave open to execute more Windows commands. You can easily and safely use this example as a solution on earlier versions of Microsoft's Windows operating systems to run the Windows commands more conveniently. No matter if it is a native Windows desktop computer, or on the way to start the Windows commands on the tablet PC, Surface Pro / Go, or even on an administrative server operating system. It has been tested on all different MS-OS and successfully verified. 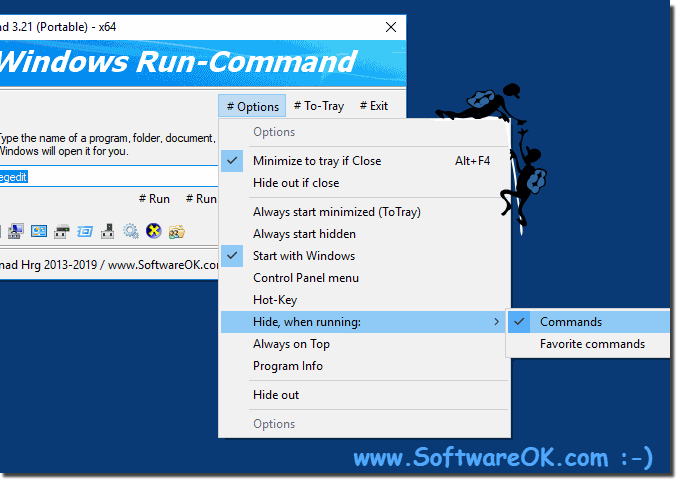 Run-Command - FAQ-3: Hide when run: commands, favorite cmd-s in Run-Command - Windows 10, 11, 8.1, 7!